Over the weekend we traveled to the home of my parents to celebrate Easter. My family is steeped in traditions regarding holidays. Most of these traditions revolve around food. Last Saturday was filled with dying hard boiled eggs, my paternal Grandmother making deviled eggs for Sunday’s dinner, and the rest of us shaping yeast rolls into bunnies. 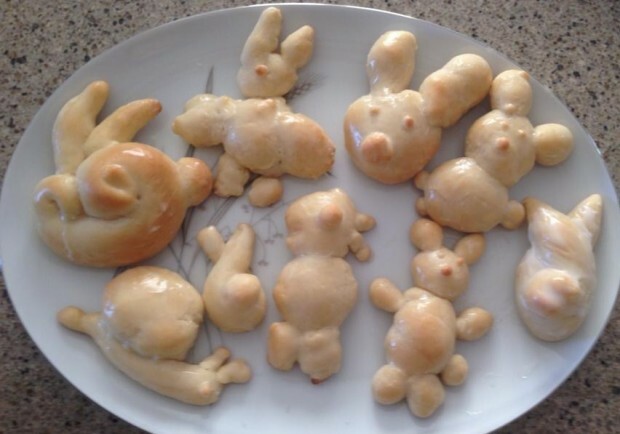 Making bunny rolls is a long-held tradition in my family. If you are able to roll a piece of dough into a long “snake”, you are encouraged to participate. As a result, all ages from toddlers to nonagenarians have participated in this annual family ritual over the last fifty years. The bunny rolls made on Saturday are served with Easter breakfast (if there are any left after sampling the rolls fresh from the oven for quality assurance). My siblings have kept the tradition of making bunny rolls alive—whether at my parents’ home or in their own homes. Visiting friends and extended family are encouraged to participate in the “making” as well as the “eating” of this holiday tradition. Bringing everybody together for a shared activity creates a memory. That memory ties us together and creates a sense of belonging. We reminisce about past Easter celebrations. We are reminded of the bread book that is no longer neatly bound together due to the number of times it has been referenced to make favorite recipes over the decades. The continuity of my mom mixing the bread dough every year brings a sense of comfort—of nurturing and love that has been present since I was a baby and has been bestowed on several generations since. When a loved one dies, we long for that sense of belonging, continuity, and comfort that we learned to expect and rely upon from a young age. Sometimes it feels like we’ve lost life’s rudder, and we don’t know where to turn or what to do. Sometimes we feel stuck in grief. A death can cause us to feel like we’re directionless—stuck in the middle of a metaphorical body of water looking around in confusion because we have no rudder and we have no paddle to get ourselves to shore and back on track. First, when we think of our loved one, our loved one is instantly in our awareness. Second, if we build upon that thought by action—recreating a special shared memory with the deceased—it strengthens that connection. As we recreate the shared activity, we become happy reminiscing about our loved one and how we used to do the activity together. Third, we are more likely to feel our dead loved one’s energy, because we’re happy and they’re happy. As our mood rises and the grief lifts a little, we are more easily able to feel the energy of our loved one. A tradition does not need to be some complicated, huge, activity. For this exercise, a tradition is any activity that you do or did with some frequency greater than once with a loved one. Maybe you used to call your grandmother every Saturday morning and tell her about your week. Now, that you cannot call her on the telephone, sit with a cup of coffee and think about how your conversation would go if she were still alive, and you COULD call her on the telephone. Imagine both sides of the conversation in your mind. Imagine her responses and her inquiries. Can you HEAR her response in your mind? Can you remember all the funny little phrases she would say or the way she would talk about people you didn’t know? Perhaps you used to help your mother clean out the perennial flower beds each Spring. Connecting with your loved one by digging in the dirt can renew your soul and give you a sense of purpose. The act of discarding the dead plant material can help you to reconnect with your mom and literally ground you in a memory of years gone past where you were able to complete this task together. Maybe you used to play cards with your son on a regular basis. You can play solitaire and reminisce about how your son used to get a twinkle in his eye right before he would win the game. You can remember how you would talk about everything and nothing as you would deal the cards and commence playing. Perhaps you used to play, “I spy with my little eye” with your husband on long road trips to pass the time. Drive around town looking for objects that would have stumped your spouse. Think about how silly the two of you were as you acted like children whiling away the time and the miles as you enjoyed spending time with one another. Regardless of what tradition you want to recreate or what memory surfaces, try to focus on the HAPPY aspects of the shared activity. Think about the banter that would make you laugh or the sense of comfort you experienced every time you shared the activity with your loved one. Even if remembering a happier time momentarily makes you sad or causes tears to be shed, you’ll find that an expression of emotion can also be cathartic. As I always say, “Be gentle with yourself!” Your grief is uniquely your own. I wish you much joy as you fondly remember traditions with your loved one. May it ease your grief and bring you comfort.